Here’s part 2 of my round-up of cool, collectible airline amenity kits, originally produced for CNBC Road Warrior. See part 1 here. A complimentary amenity kit filled with deluxe-sized, beauty, grooming and lifestyle products chosen by the sample-savvy folks at Birchbox is one of the perks included with JetBlue’s upgraded, coast-to-to-coast Mint service introduced in June, 2014. The kit content will change quarterly but the mix of premium sample items started off with everything from Benefit Cosmetics mascara in the women’s kit to Ernest Supplies Cooling Shave Cream in the kit for men. Finnair offers business class passengers a minimalist, eco-friendly amenity kit that includes socks, an eye-mask and earplugs packaged in a brown paper envelope. A more elaborate, but equally-eco amenities kit, with items in a green tea or birch scent, is available on request. 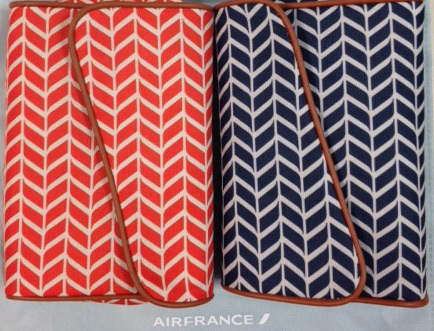 Business class customers on Air France now receive an amenity kit filled with Clarins cosmetics as well as mouthwash, slipper socks, toothbrush and eye shade. Passengers in the airline’s La Premiere cabins receive a leather cosmetics kit designed by Givenchy filled with skin care products by Biologique Recherche, including face cream, an anti-fatigue roll-on for the eyes, an eye mask, lip balm, hand cream and an oshibori hand towel. Etihad, the national airline of the United Arab Emirates, gives passengers in economy, business and first class cabins amenity kits that feature patterns of Sadou, a colorful, intricate and centuries-old Abu Dhabi weaving craft traditionally used on blankets, cushions and Bedouin tents. In addition to the nice array of products inside the bags, “I love the fact that Etihad has invested in an authentic design for their kits, embracing their cultural roots,” said Jonny Clark, a commercial pilot who evaluates airline products and design at TheDesignAir.